Welcome to DeNami's September Blog Hop! If you are following the blog hop, you must have come from the talented Rochelle Washington's blog! If you missed the previous blog stops, you can hop back over to the DeNami Blog to start from the beginning. 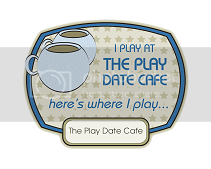 You have until September 12th, 2011, 11:59pm PST to leave comments on all the blogs in order to be eligible to receive one of the two $20 DeNami gift certificates. Winners will be chosen randomly. Good luck! 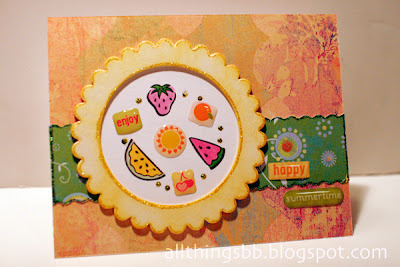 For this Blog Hop, I used the Tropical Fruit Stamp from DeNami's Petit Fours collections. These stamps are perfect for any summer themes. In making this card, I used 3 stamps only. I stamped and coloured the images on white card stock, added epoxy stickers to form a circle around the sun, and added stickles to the inked frame. I had fun making this summery card. I love using bright colours and yummy fruits. I hope this will brighten up your day too! Thanks again for stopping by! 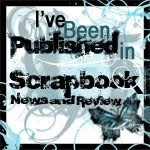 Your next stop is the wonderful blog of Wendy Elliot. That is totally what's going on in my head right now. What sweet do I want? LOL Love your card. Very yummy looking! Super fun card!! LOVE those yummy tropical fruits!!! Beautiful card - love the color scheme and the dp used on the background! Cute card - love that background! Very cute card! I love the colors! 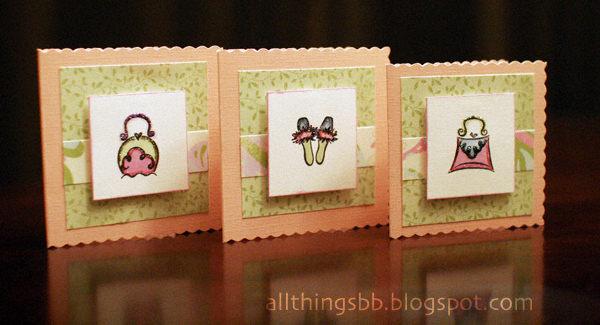 Such a bright and summery card full of fun colors! Love the elements you put together to make this. Darling card! Love your colors and design! Thanks for sharing! Wow so cute!! I love the background as well. Great job!! Great card! Love the berries & melon! Thanks for sharing! Oohh this looks good enough to eat! Yummy for me to eat1 Love it! These colors work together so good! Great card! Such a yummy and fun card, Shirley! Such a summertime card! The big sun with all the making of some great lemonade and other punches. Very cute. Love the inspiration. Very yummy and summery card! Yummy card Shirley!!! What a fabulous creation! Yummy colors and great way to showcase the tasty treats of fresh fruit! Fun and yummy too. Your card truly is a tasty treat for the eyes.